The Holiday Axe is a promotional item from the Holiday season of 2017-18. Players could purchase it from /Shopworld for 20,170 Rupees. 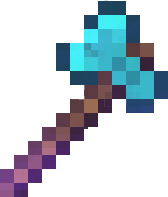 It is an enchanted diamond axe that has a custom lore and name (as shown to the right). Its enchantments are not obtainable in normal vanilla gameplay. The Holiday Axe item from 2013 shares the same enchantments as the Pick.